"This tale of friendship born out of adversity offers the reader a pallet of watercolors and pen and ink illustrations that connect us to a young dinosaur who wants to do something his body isn't able to accomplish. The playful interplay of water and pen and ink capture the emotions and the challenge of a quest that friendship ultimately resolves. You'll be charmed and entertained by Ollie as his yearns to swim, and you'll also see just how irate a featherless Tugg can get. The storyline and the art combine for a tale that will keep readers smiling, laughing, and looking for more." When my son was 4 years old, he asked me during dinner if dinosaurs (Allosaurus in particular) could swim. I wrongly said no, but it gave me a good idea to teach him to look before jumping and how to right your wrongs in life. He took a 10 day trip with my wife, and when he returned, I had a rough draft for what was to become Ollie and Tugg. 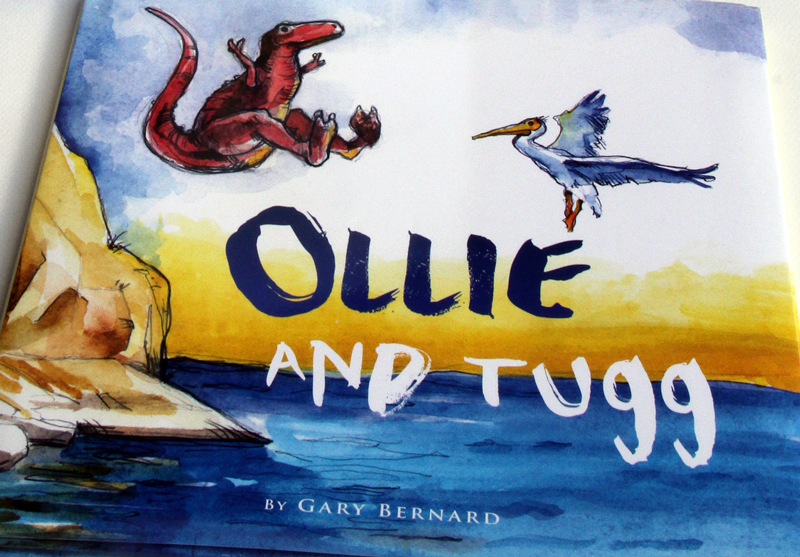 After a rough start when meeting a pelican named Tugg, he eventually finds a way to swim and in the process learns a few things about life and friendship.